Developed by Insomniac Games, creators of the critically acclaimed Ratchet & Clank franchise, Resistance: Fall Of ManTM is a gripping first-person action game developed exclusively for the PlayStation®3 computer entertainment system. 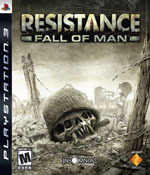 Set in a frightening, alternate 20th century reality, Resistance: Fall of Man capitalizes on PlayStation 3's superior processing power to deliver a unique blend of harrowing military action and unnerving horror. Utilizing its signature creative style, Insomniac Games has created a truly next-generation experience featuring smarter enemies, a wide variety of horrifying creatures, physics-based weaponry, playable vehicles and highly detailed, diverse environments. Players will be challenged online and offline as Resistance: Fall of Man delivers an engaging single player campaign, a co-operative mode and one of the most complete multiplayer offerings in a console game. In Resistance: Fall of Man, the U.S. and Britain band together in a last-ditch effort to save Europe and Asia from a horrific scourge. In mere decades, the Chimera – a species of unknown origin propagating a virus that converts other life forms into more Chimera – has overrun Russia and all of Europe. Humanity's hope for survival is slim, and the tide of the battle rests on the shoulders of U.S. Army Ranger, Sgt. Nathan Hale. * Resistance: Fall of Man draws players into a deep, frightening story that rewrites the 20th century and pits the United States and Britain against a horrific species of unknown origin. * In addition to an epic single player campaign, Resistance: Fall of Man features co-op, split screen multiplayer and highly customizable online gameplay. * PlayStation 3's superior power enables Resistance: Fall of Man to feature a wide variety of fluidly moving characters that exhibit more sophisticated behaviors and interact with their environments more realistically. * Greater processing power on PlayStation 3 and Blu-ray technology enables more immersive visual and sound effects in Resistance: Fall of Man, heightening the chaos of large-scale warfare. * A powerful rendering engine allows Resistance: Fall of Man to feature a greater variety of highly detailed and interactive environments for a console FPS experience, including large battlefields and sprawling military command centers. * Insomniac Games has combined its passion for creating exotic weapons and vehicles with a proprietary physics system to create a unique human and alien arsenal. Resistance: Fall of Man 18 images. Registered users can 'subscribe' to this group and receive an email whenever a news article is added that contains the tag 'Resistance: Fall of Man'.